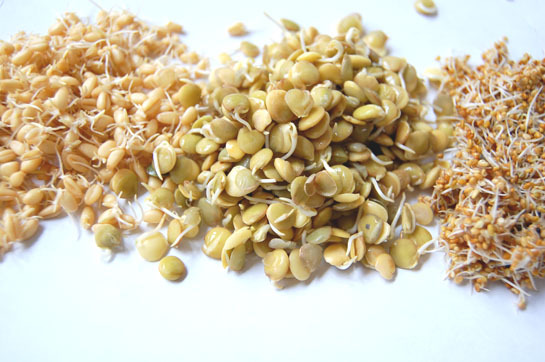 Sprouted Grains are more Nutritious: Sprouts may look tiny and unassuming, but these little plant powerhouses pack a big nutritional punch! They’re rich source of essential vitamins, easy to grow, versatile, and inexpensive, and they’re a fabulous way to incorporate raw foods into your diet. The science behind it is simple: dry grains, beans and seeds, though rich in protein, are not very high in vitamin content and not as easy for the body to digest. But sprouting turns them into living foods, increasing their vitamin content exponentially and making them more easily digestible. Sprouted foods are at their peak nutritionally, and contain valuable enzymes, minerals, and antioxidants in addition to their abundant vitamins. Even people with food sensitivities such as wheat and tend to find that their digestive systems are able to handle the offending food when it’s in sprouted form. Sprouts are full of fiber and help to keep you full, and their balance of protein and carbohydrate content helps to keep your blood sugar stabilized, so they’re a great dietary tool for the maintenance of healthy weight. Sprouts can add a surprisingly delicious twist to your food, or can be eaten all by themselves. There are an abundance of varieties available, each with its own distinct texture and flavor, all nutritionally complete – alfalfa, mungbean, quinoa, sunflower, broccoli, wheat … the list goes on and on. They’re simple, fun, and quick to grow, whether you use a pot of dirt or an inexpensive sprouter (specially designed containers made to grow larger amounts of sprouts). Sprouted grains are whole grains, and whole grains are healthier than their refined-grain alternatives, like white bread, pasta, and rice. Improve Digestibility and have more Vitamin B – A 1989 analysis in Food Science and Nutrition found that sprouted grains improved digestibility of nutrients and levels of some amino acids, total sugars and B vitamins. Rich in fiber – Germination increases the total dietary fiber and soluble fiber of wheat. Fights Diabetes -Sprouted brown rice improved the blood concentrations of fasting blood glucose, fructosamine, serum total cholesterol and triacylglycerol. More protein, B vitamins, vitamin C, folate, and calcium. Sprouted grains improve digestibility and may also scavenge free radicals, reduce the cholesterol level and improve the immune system. More antioxidants and better control for people with type 2 diabetes. Bread and cereal grains after germination have more antioxidants and are able to improve metabolic control in people with type 2 diabetes.